We are an agritourism venue with animals, plants and customers. We are looking for a part time person OR someone who can give our farm animals their primary care 5 days/week and do general farm maintenance including mowing, etc. Additional duties include supervision of others. We serve families, so we expect professional appearance. Equine & small farm animal experience is required. Customer service background is helpful. Expect to work weekends and holidays in the summer. Knowledge and use of farm equipment is desirable. This is a full time salaried position OR a part time hourly position. The salary will be determined based on education and experience. The farmer in residence will assist the Manager in all farm operations at Shalom Farm – a 6-acre nonprofit community farm project in rural Goochland County, Virginia. The farmer in residence will also lead visitors and volunteers in farm tours and work. The scope of the residency may broaden to include engagement in urban gardening and food entrepreneurship programs in low-income neighborhoods of Richmond. The farmer in residence’s involvement in off-farm food access activities will be determined by his/her interest and the needs of the organization. The farmer in residence must have a strong desire to learn and a willingness to work hard. Farming or gardening experience is strongly preferred. The farmer in residence must be prepared for strenuous labor under potentially extreme weather conditions. We will work with the farmer in residence to develop a curriculum to further his/her education in sustainable agriculture, food security issues, and nutrition. Educational opportunities on the farm include seed propagation, transplanting, composting, soil amending and care, harvesting, egg production and more. A driver’s license and vehicle for commuting to the city for programming and distributing produce is required. Shalom Farms is a nonprofit community farm project with the overarching goal of increasing access to healthy food in the Richmond region, particularly in low-income urban neighborhoods. Our approach is two-fold – 1) we meet immediate need by making fresh produce available at low or no cost to people with limited food access, and 2) we work for long-term transformation of the food system by providing educational opportunities in diet, health, and agriculture. We are currently growing produce on 6 acres in rural Goochland County (about 35 miles west of Richmond) on property owned by Camp Westview on the James, a Methodist camp and retreat center. About 1/3 of our produce is sent to the Central Virginia Food Bank, while the rest is used in after-school programs, cooking classes, food pantries, meal programs and youth-run farm stands at partner organizations in East End and South Side neighborhoods of Richmond. We grow about twenty basic vegetable and fruit crops, all chosen for their widespread appeal and accessibility in the communities we serve. We also cultivate a small blackberry and raspberry orchard and maintain a small-scale egg operation with 30 chickens. While not certified organic, we use organic methods, emphasizing soil care through composting, mulching, cover cropping and other practices that enhance microbial life. We do not use any synthetic fertilizers, fungicides, or pesticides. In addition to food production, the farm offers an outdoor learning experience for thousands of volunteers and visitors each year. Located on the grounds of Camp Westview on the James, Shalom Farm is frequented by campers who visit the farm throughout the summer to work and learn. For a quick glance at Shalom Farm, visit our website or Facebook page. Compensation: Modest living stipend, housing, and farm produce provided. To apply for this position, please send cover letter, resume, and 2-3 references to Missy Botha at info@shalomfarms.org This position is open until filled. Welcome Back to the Virginia Beginning Farmer Connections Blog! We have seen a lot of changes and progress with the Virginia Beginning Farmer and Rancher Coalition Program since our last blog post! We thought we would reopen our blog with an update on some of our goings-on in the last year. In addition to reading this blog post, you can view our most recent newsletter here. Our farmer mentoring program is in full swing! Our goal this year is to focus on local community mentoring in three locations across Virginia: the New River Valley, far southwest Virginia (e.g. Wise, Lee, and Washington Counties), and the Loudon County area of northern Virginia. Our farmer mentor coordinators hold on-farm events and hands-on learning experiences to link beginning farmers with experienced farmers. 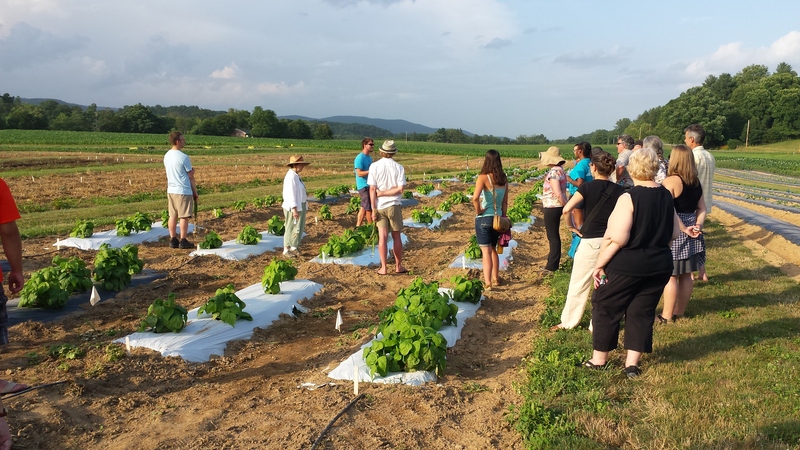 So far, two Twilight Farm Tours have taken place this summer at the Kentland Farm in Blacksburg, VA and Brann-King Farms in Riner, VA. Visit the events page of our website to keep updated on Virginia Beginning Farmer and other events. In December, several members of the Virginia Beginning Farmer team spoke at the Virginia Farm to Table Conference on labor issues affecting beginning and start-up farmers. A resource that was published as a follow-up to this workshop can be found on our publications page. In addition, the Virginia Beginning Farmer team held multiple workshops on enterprise budgets for beginning farmers throughout the winter and spring of 2015. In June 2015, Anne Geyer of Agriberry Farm and Allyssa Mark of the Virginia Beginning Farmer and Rancher Coalition Program presented a webinar on Critical Farm Labor Issues for Beginning and Start-Up Farmers. The webinar began with a broad overview of sources of farm labor, and topics to consider before taking new labor onto your farm, including: legal, management, insurance, and fair practice issues. Following this, Anne shared the labor story of Agriberry Farm and gave us great advice on hiring and working with farm workers and interns. In July, Dr. Kimberly Morgan of the Virginia Tech Department of Agricultural and Applied Economics presented a webinar on Enterprise Analysis: Farm Financial System Overview. Kim gave an introduction to farm financial statements and farm planning budgets, including: balance sheets, income statements, statements of cash flows, and enterprise analysis. Coming up in August, Andy Sorrell, VDACS Coordinator of the Office of Farmland Preservation, and Katie Myer, Certified Farm Seeker Coordinator, will give a webinar on Land Transfer Planning Tools: Virginia Farm Link and the Certified Farm Seeker Program. They will give a detailed walk-through of the required components of the Certified Farm Seeker program and common questions their applicants have as they complete the modules of the program. We will be writing a blog post after the webinar related to land transfer and these programs, so keep an eye out! For more details on upcoming webinars, or to view past webinars, visit our webinar page. We are excited to return to Virginia Beginning Farmer Connections! Until our next post, you can stay updated by visiting our website. Either click our logo in the top right corner of this page or visit vabeginningfarmer.org.